The term kyphosis is used to describe the spinal curve that results in an abnormally rounded back. 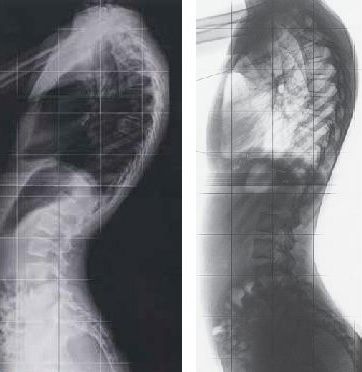 Postural kyphosis – often attributed to slouching. It represents an exaggerated, but flexible, increase in the natural curve of the spine. It usually becomes noticeable during adolescence. Sheuermann’s kyphosis – is a rigid deformity and it does not correct when patient is asked to stand tall or when asked to bend forward. It’s a structural kyphosis that occurs when the front section of the vertebrae grow more slowly than the back sections. This results in wedge-shaped vertebrae. It occurs during a period of rapid growth, usually between the ages of twelve and fifteen. An initial programme of conservative treatment that includes exercise and anti-inflammatory medication is recommended for patients with Sheuermann’s kyphosis. If the patient is still growing, the doctor may prescribe a brace. The patient typically wears the brace until skeletal maturity is reached. Surgery may be recommended if the kyphotic curve exceeds seventy five degrees. The sBrace, is a new definition of effectiveness and efficiency to treat the sagittal profile of the spine. The sBrace has been providing great results and satisfied patients since 2004.The 2010 sBrace is the new generation of the tried and tested reclining corset with many innovate improvements. The correction zones are more anotomical and functional in design. The new sBrace is the trunk orthosis for effective and successful treatment of the sagittal profile of the spine. Experts have great respect for the highly functional and effective design of the robust sBrace, and users appreciate the practical and versatile possibilities of adaption in all situations of everyday life. Thoracic kyphosis, Scheuermann’s disease of the thoracic spine, back pain management, sagittal realignment, SRA.